Mike Tyson is the self-proclaimed baddest man on the planet. If you ask his long line of knockout victims from over the years, they'd tend to agree. A high-end Mike Tyson figure from Storm Collectibles is taking things to another level. And it's amazing. 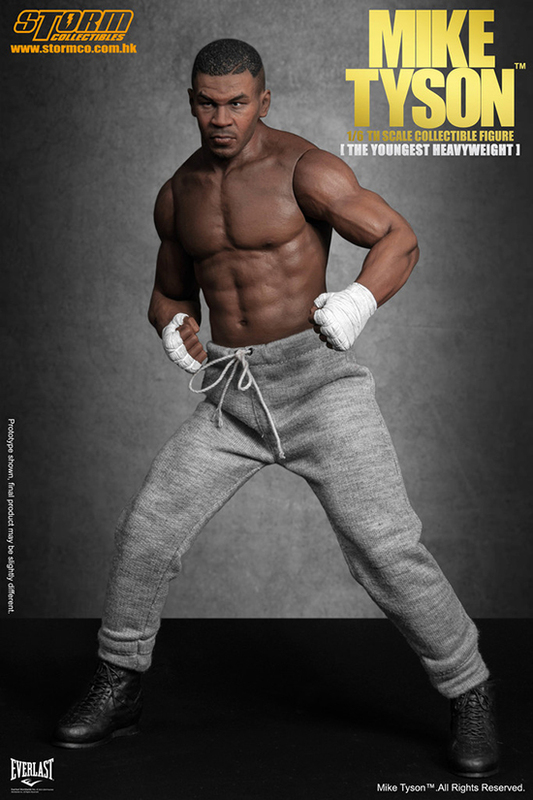 Titled, "The Youngest Heavyweight," Storm's Mike Tyson figure is done in 1/6th scale. It's based on the fighter when he was in his prime during the late 1980s and taking care of everything put in his path (both in the ring and on Nintendo). Fully endorsed by the boxer, the likeness really is lifelike. Standing approximately 12" tall, the sculpt gives him a ripped physique with moveable arms and legs. Depending on how you want to display it, there are two different faces, one calm and one where Tyson's flashing his mouth guard and going in for the kill. Storm's Mike Tyson figure has several other interchangeable parts. For hands, taped fists and taped open palms. A pair of Everlast boxing gloves is also included. You can have the former Heavyweight Champion in his boots or barefoot. Other accessories include a grey sweatsuit, black shorts like Tyson would wear in the ring and a display stand with speed bag. Those that pre-order direct from Storm get an exclusive championship belt as well. The cost of the Storm Mike Tyson: The Youngest Heavyweight figure isn't cheap. The manufacturer has it up for pre-sale for $229 plus shipping ($50 to North America from overseas). , there aren't many. Before this, the most recent came out in 2014 from Bif Bang Pow. Modeled after old Mego figures, it's based on the animated Mike Tyson Mysteries Adult Swim cartoon. It gives off a very different vibe. 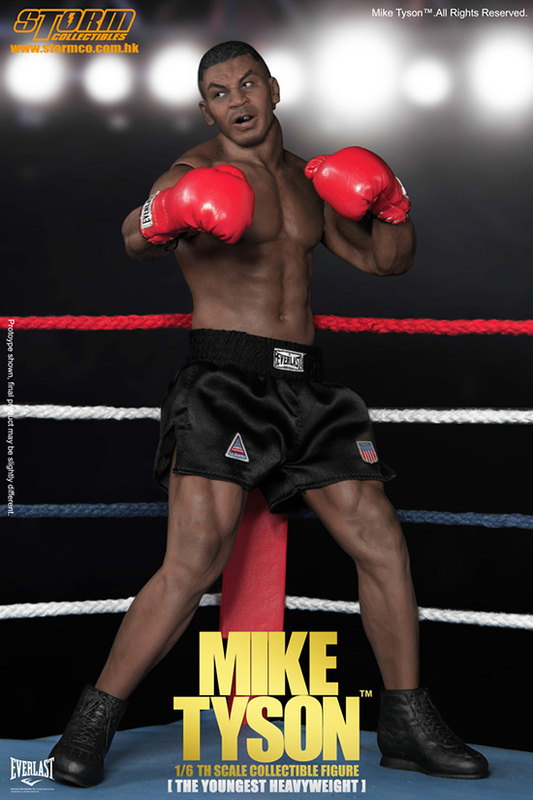 Jakks Pacific also did a couple of different Mike Tyson figures based on his appearance in Rocky Balboa. 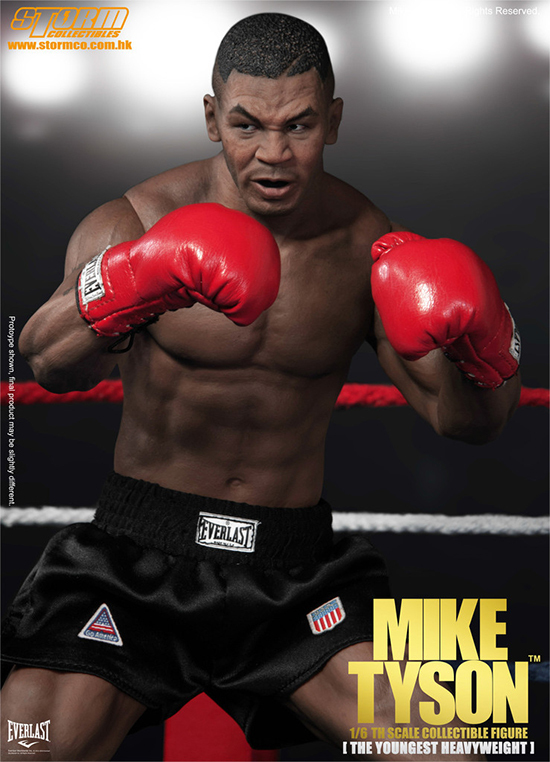 The Storm Mike Tyson figure is scheduled to be available in the second half of the year.